I'm posting my blog a day early in case you didn't know, Wednesday April 3 is International Walking Day. I did take a walk this morning. And after being prodded by my doctor, I'm committing to make more of an effort in doing so on a regular basis. I can get so caught up in everyday stuff which includes writing. Sitting at my computer, with a cup of coffee, and wearing comfy slippers on my feet, I ignore the fact that my body needs to go outside and move. I used to walk daily, but with the cold wet winter, arthritis in both knees and just being lazy, walking has gotten spotty. 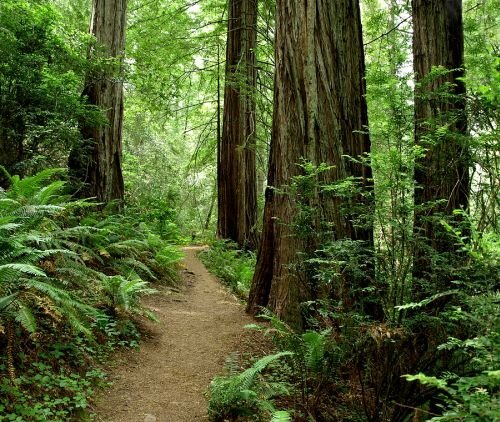 My resistance is kind of crazy because I live in a forest where there are many gorgeous trails lined with fern and giant redwoods and the beach is a 10 minute drive away, my office is located in a small town and only two blocks from my office is a walking trail in apple country, I have plenty of places to walk. The natural beauty alone should lure me. Right now the apple blossoms are luscious. I know walking is good for my heart, my lungs, my weight, my endurance, and my sunshine personality . I just feel better after I've done it. But putting on those walking shoes and stepping out the door can seem like such a chore and pretty soon I don't even think about it. Well today I walked, I feel energized, committed, my doctor will like my report and I wrote a poem and a blog about it. Win-Win five times over. Mary Oliver was known to write many poems from her walks. Dylan Thomas wrote one of his finest after a walk. William Wordsworth is said to have walked an estimated 180,000 miles during his lifetime, many of his poems born on those walks. Our own Badger, right here at PMO, said he loves walking more than writing. That comment came as a surprise because his love of writing is clearly evident in every poem he writes. not the inside of a stone. Still in the water and singing-birds. Sauntering to pluck the strawberries wild, unseen. Thro’ tall, green, silent woods and ruins grey. So if it is cold out, throw on a jacket, or warm in your part of the earth, wear some shorts. But don't forget those walking shoes, step outside and join the world in taking a walk. And when you're done, maybe there will be a poem in you that you'd like to share, share it here.